Your child’s baby teeth help your child chew and speak normally. They will also hold space in the jaws for the adult teeth that come in later. Starting infants with good oral care can help protect their teeth for decades to come. A baby’s teeth start to erupt when the baby is about 6 months old. By the age of 3, most children will have a full set of 20 primary teeth. These primary teeth will be lost starting at age of 6, to give space for permanent teeth. By the age of 21, a person usually have a full set of adult teeth. 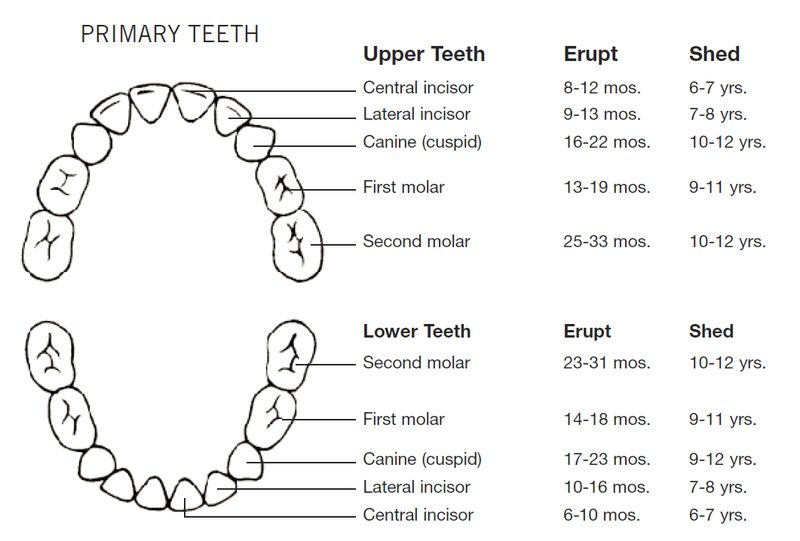 The picture below shows the names of baby teeth. It also depicts when each baby tooth will usually erupts and is shed. Notice that not all children get the same teeth at the same times. Your child may have teeth come in earlier or later than the time shown.